Anila Jacob; Inset: Anoop and Anila Jacob| Express Photos by Kaviyoor Santhosh and N P Jayan. At Nanthancode, in Thiruvananthapuram, in the 1990s, Anoop and Anila Jacob would go to school together with their friends. While he studied in Christ Nagar, she was in Nirmala Bhavan. She remembers the uniform he wore. “It was a white shirt, navy blue pants, maroon tie, and black shoes,” she says. One day, when they were in Class 9, Anoop took Anila aside and told her that he loved her. “I also liked him, but I kept quiet,” she says. After their graduation, they tied the knot on May 23, 2002 at the St. Peter’s Orthodox Jacobite church. And after 10 years of marriage, Anila likes her husband’s simple and loving nature. “There is no show but I know that Anoop cares for me,” she says. “He has also given me a lot of freedom.” As for his drawbacks, Anoop was an introvert for many years. “He used to have a small circle of friends,” says Anila. But all this changed when T M Jacob died of liver failure on October 30, 2011, at the age of 61. Incidentally, Anoop (UDF) won the March 2012 election by defeating M.J. Jacob of the LDF. But Anoop has paid a price, following this win. “He told me that he has been so busy, he has not been able to grieve over his father’s death,” says Anila. As a result, Anoop and Anila rarely have any time together. But, recently, on Ramzan, when Anoop had some free time, they went and saw a film, ‘Ustad Hotel’. 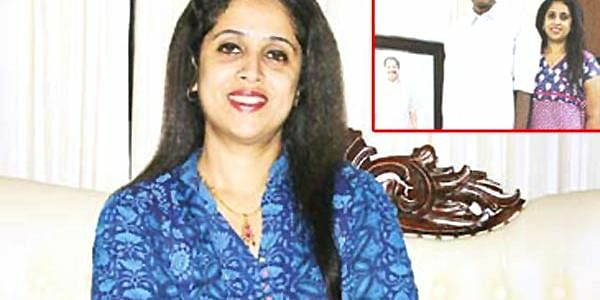 Anila says, the first seven years were the most wonderful when Anoop was practicing in the High Court and they lived in Vytilla, Kochi, far away from the glare of the public spotlight. Anila has found it difficult to adjust to the limelight.